Parma wallabies come from the forests of New South Wales, which is in the south east corner of Australia. They are sometimes known as white-throated. 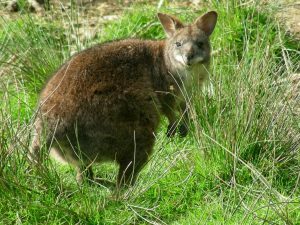 The Parma wallabies are mainly nocturnal, coming out in the late afternoon to graze on the reedy grasses, herbaceous plants and shoots of young plants which are their main foods. They are normally active until early the next morning. During the day they rest in clumps of trees or bushes. The wallaby’s large, powerful tail is used for balance when hopping or grazing. The large mobile ears give the wallaby an excellent sense of hearing. 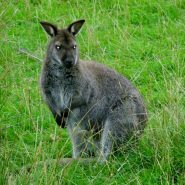 Its sense of smell is also acute but like many nocturnal animals its eyesight is not very acute..
Parma Wallabies are often solitary although two or three individuals may come together from time to time to form small groups.. There is no real social organisation with both sexes and all ages interacting equally; They communicate in a number of ways including visually, by stamping, quivering and tail wagging; through scent, which is especially important at mating times; and vocally, by hissing, clucking and coughing. They tend to breed from March to July in the wild with one “joey” being born into the pouch after a gestation of 35 days. The female can become pregnant again just two days after giving birth. The newly fertilised embryo will only partially develop and will then remain in stasis until the existing “joey” leaves the pouch at around 30 weeks. Although the elder “joey” will continue to feed by putting its head in the pouch, the new embryo is then able to continue its development. Parma Wallabies are herbivorous and feed on and herbaceous plants. Be the first to review “Parma Wallaby” Click here to cancel reply.